During her lifetime, Williamina Paton Fleming was America's most famous female astronomer. 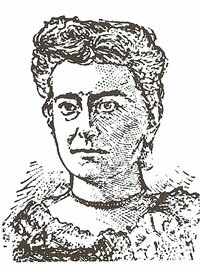 In 1906 she became the first American to become a member of the Royal Astronomical Society. ■ Williamina Paton Stevens was born May 15, 1857, in Dundee. Her father operated a picture framing business and dabbled in early photography. He died when she was seven. She married James Orr Fleming in 1877. ■ The following year the Flemings emigrated to Boston. In 1879 the marriage foundered and she went to work for Prof. E.C. Pickering of Harvard, a director of the college observatory. ■ She soon showed a talent for astronomy and worked on star classification. She set up her own system with 10, 351 stars listed in a special catalog. These included 222 stars which she had discovered herself. The eminent British astronomer H.H. Turner termed Mrs. Fleming's discoveries "an achievement bordering on the marvellous." ■ Among 28 novae stars known at the time of her death, Mrs. Fleming had discovered 10 by their spectra. She also discovered 94 of the 107 Rayet stars known at the time of her death. ■ Mrs. Fleming edited all of the publications that issued from the Harvard Observatory shortly after she started work there. In 1898 Harvard formally acknowledged the value of her services by giving her the official appointment as curator of astronomical photographs. It was the first such appointment given by Harvard University to a woman. Later she was placed in charge of the astrophotographic building. ■ She worked long hours at her job, her health suffered, and she became ill of pneumonia in the fall of 1910. She died in Boston the following spring on May 12, 1911. She was 54.